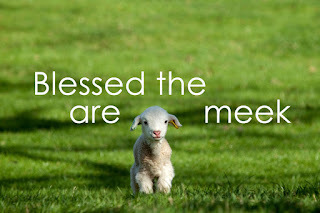 If you were to study the biblical definition of "meekness" as Jesus uses the word in Matthew 5:5, you would likely at some point read something along the lines of "meekness is strength under control" or "meekness does not mean weakness." These are ideas that are in a sense true enough. But even more they are ideas that are attractive to us. By our very nature we recoil at the idea that we are weak, or worse yet that weakness is something to embrace. We want to be thought of as strong and self-controlled. What father teaches his son that meekness is something to be pursued? No, we encourage our children to be strong -- to stand up for themselves. But, as He seems to do so often Jesus turns common sense on its head. 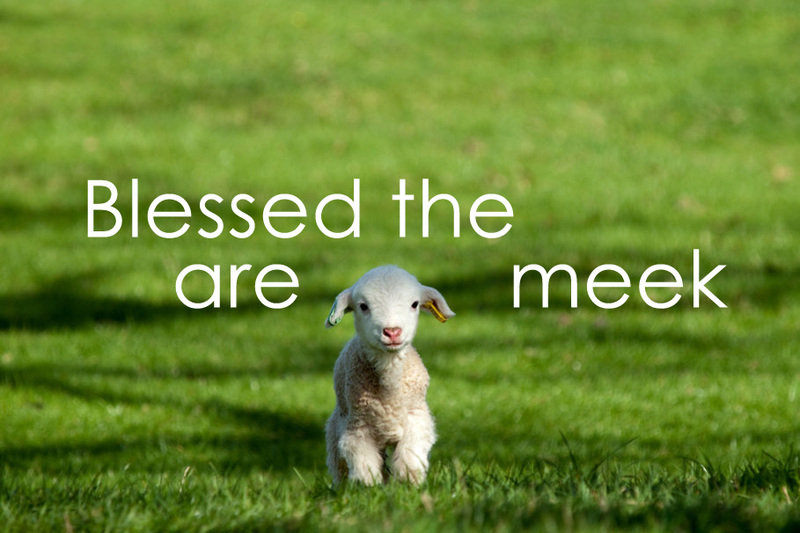 It is the meek who are blessed, he tells us. They are the ones who will inherit the earth. In the face of this odd proclamation we take solace in the fact that meekness doesn't mean weakness. We can be meek and still be strong, or so we think. Indeed, if we were so inclined we could make that guy who hurled the insult at us, or that guy who stole from us, pay for fooling with the wrong follower of Jesus -- we just choose not to do so. Unfortunately, to the extent that strength can be associated with meekness I do not believe that is what Jesus has in mind. Jesus has already told us that it is the "poor in spirit" -- not the strong -- who will inherit the kingdom of heaven. To enter the narrow gate we must accept that we are beggars with nothing to offer -- utterly unable to save ourselves. He has also told us that it is those who mourn who will be comforted. True spiritual mourning -- true repentance -- is a gut wrenching experience. Spiritual mourning does not leave us with a feeling of strength, but a feeling of dependence and hopefully gratitude. It is this place of recognizing our spiritual poverty and mourning over our sin that makes the call to meekness possible. What pride could remain in us from this vantage point? We have nothing and we are nothing -- we have no strength of our own to commend to anyone. The language used by Jesus himself does nothing to suggest that meekness in any way implies or is connected to our own human strength. The Greek word found in Matthew 5:5 is πραύς (praus), which means "meek, gentle, kind, forgiving, mild, benevolent, or humane." "Meek" in English simply means "quiet, gentle, and easily imposed on; submissive." I personally think that "easily imposed on" and "submissive" are pretty good definitions. This is not to say that "strength" has no part in the conversation about meekness. I think it does. But I also think there are two aspects of this strength that we should seriously consider. The first is that, like everything else, whatever strength is required to be successfully meek cannot be human strength. Jesus has made it abundantly clear that we can do nothing apart from Him. John 15:5 (“I am the vine; you are the branches. If you remain in me and I in you, you will bear much fruit; apart from me you can do nothing."). Meekness is not a matter of self-discipline -- mastering self-control. It is something that comes from the grace of God. The second is that the strength that is required to be truly meek is not abstract or indiscriminate -- it is purposeful. It is not merely a matter of showing that "I am the bigger person" or I am "taking the high road." That is the strength people use to bring glory to themselves. No, the strength that is needed to be truly meek will never show the world how great you are -- but it will always show the world how great Jesus is. It is the strength that allowed Paul to "become all things to all people so that by all possible means some might be saved." 1 Corinthians 9:22. Paul did not become submissive or easily imposed on for his own glory -- but for the glory of God. "I do all this for the sake of the gospel, that I may share in its blessings." 1 Corinthians 9:23. There is much more so say about all of this. But I will leave you with this quote from FB Meyer. "Many ancient authorities place meekness next [after mourning], and it seems the natural order, for the soul that realizes its own nothingness and helplessness is likely to be meek. The meek are so occupied with their desire that God's grace should pass through them to their fellows that they are prepared to sink all considerations of their own standing and position so long as nothing may interfere with the effect for which they long. Their only thought is to carry their point, to bless men who do not want to be blessed, to vanquish hate by love, and rebellion by loving-kindness and tender mercy. They cannot afford, therefore, to be always standing on their own dignity and defending their own rights. These are willingly cast into the furnace to augment the flame, that the obdurate metal may be fused. "Being reviled, we bless; being persecuted, we endure; being defamed, we entreat. We are made as the filth of the world, the offscouring of all things; but all things are for your sakes, that the abundant grace through the thanksgiving of many may abound to the glory of God." The way to become meek is to be absorbingly taken up with the love of Christ for me. Be lowly before God, allowing His love to enter and fill thy heart, and thou wilt find it easy to be meek towards man. Thy pride will be driven out by the expulsive power of the new affection. Thou wilt be prepared to accept flouts and sneers, if only thou canst bless and help others; even as God who answers not the blasphemous and hard things that are said against Him, but continues to send His rain and cause His sun to shine to bring men back in penitence to His heart. It would be a great mistake, however, to suppose that the meek are cowardly, deficient in strength of purpose or force of will: they are among the strongest and most strenuous of men. But they are strong in patience and strenuous in seeking the salvation of others. Let the cause of righteousness, justice, or truth be in question, none are so unbending or stalwart as they. Of the wrongs done to themselves they are disposed to take no count, but they dare not refrain from bearing witness, both by speech and act, whenever the sacred majesty of truth is assailed and in danger of being trampled under foot."